I've been using the same old Fusion ProGlide razor for too long. I mean, I've been using the same BLADE for way too long. And also using the same handle for too long. It's time for a change. And there seem to be two very good options! Both will save me money, and I'll be using sharp blades and a new handle. But which one should I go with - Dollar Shave Club, or Harry's? Both plans work in roughly the same way. You sign up for a blade plan, you pay a certain amount of money every month, you get a brand-new handle at the outset, and you get a shipment of blades at a regular interval. Both of these companies offer a line of shaving accessories - creams, gels, and so forth. Dollar Shave Club even has something called "One Wipe Charlies", which are toilet wipes. We're going to ignore the add-ons, for the purposes of this comparison. Just razors and blades. Left-to-Right -- The "Humble Twin", the "4X", and the "Executive"
Both plans have "cheap" options. At Dollar Shave Club, that means the "Humble Twin", a two-blade, Gilette Sensor-type razor. You get 5 cartridges per month, for $1 (actually $3, because they charge S&H for this and ONLY this plan.) That works out to about 60 cents per cartridge. The most popular plan is the "4X", which is a four-blade razor, along the lines of the Schick Quattro - it also looks a bit like a Gillette Mach3. The 4X plan costs $6/month, and you get 4 cartridges. That's $1.50 per blade. Finally, Dollar Shave Plan offers the "Executive", which jumps right past the Fusion's 5 blades and goes straight to 6. The Executive plan costs $9/month, and you get 4 cartridges - so $2.25 per cartridge. In short, Dollar Shave Club differentiates its plans by the quality of the cartridge. 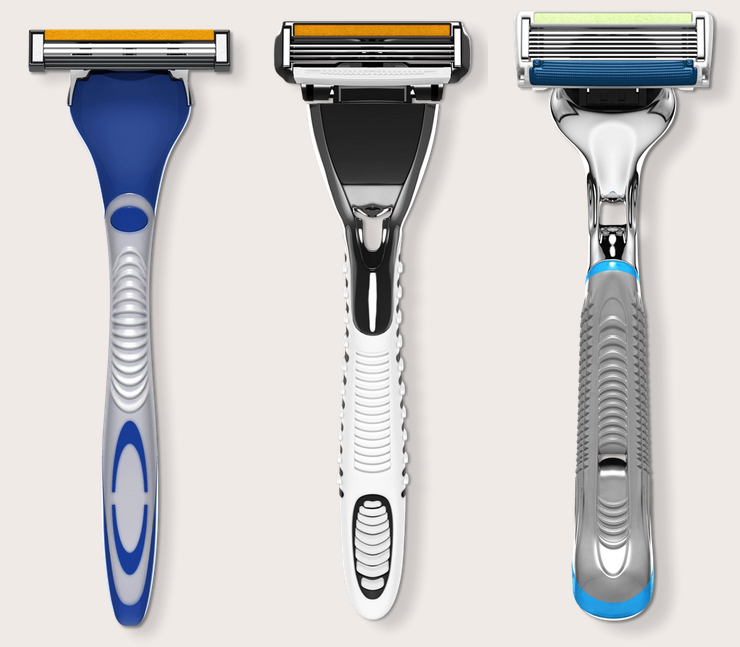 Their razors are all styled much like Gillette's or Schick's -- rubber grips, futuristic styling and more chrome as you move up. Harry's works a bit differently. Most notably, there's only 1 style of blade cartridge. 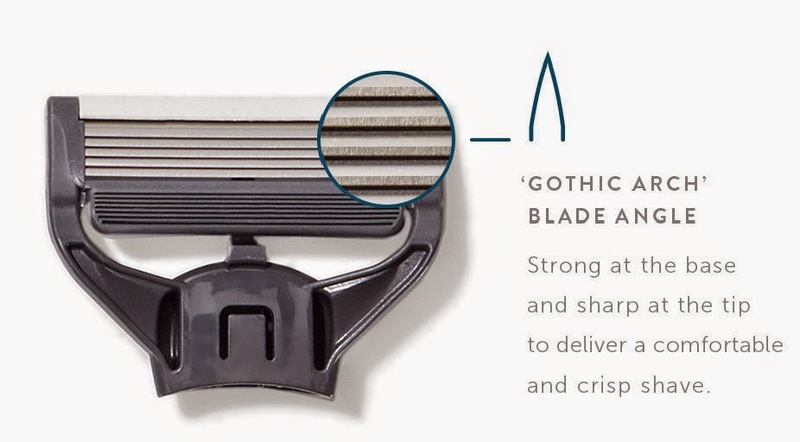 It's a very Fusion-like 5 blades, but without the trimmer-on-the-back function. Your Harry's plan cost will be higher or lower based on the frequency that you receive a shipment of 8 blades. It may be every 2 months, every 3 months, or every 5 months, depending on how often you shave. We're doing an apples-to-apples comparison with DSC, so let's focus on the "8 blades every 2 months", or 4 blades/month, plan. That runs $7.50 per month, for 4 blades - $1.88 per blade. Now, Harry's blade HANDLES are a different look. They're clearly going for the "elegant" look, instead of the "futuristic" look. Less "Gillette ProGlide", and more "Art of Shaving". There is only 1 handle style available, but with a lot of choices of colors and materials. The basic "Truman" comes in orange, ivory, navy and olive. Finally, the "Winston" is all-chrome, and can be monogrammed. If you follow AAAD, you probably guessed that I was going to go with the "better styled" choice. 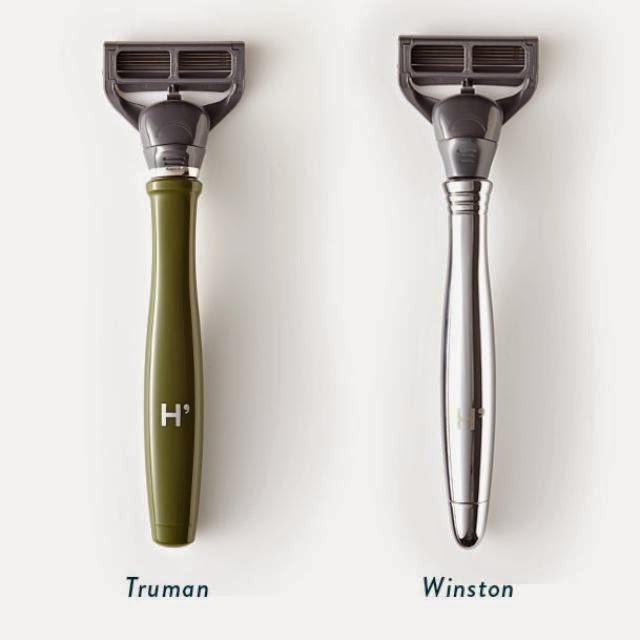 Harry's Winston razor is the closest thing I've seen to the Art of Shaving Chrome Fusion razor - but that razor goes for $100-plus, and requires the use of $4 Fusion blades! I also signed up for a $7.50/month shave plan, which will deliver 8 blades every 2 months. So far, no add-ons... but we'll see if Harry's shaving cream can beat Barbasol soon enough. SO HOW DID IT TURN OUT? CLICK HERE FOR THE HARRY'S REVIEW. I did the math on this last year and, if you buy on discount the triple blade Gillette Sensor Excel (which I think is the best shave with out carving your face up or buying some German razor), it comes out the same or cheaper than the cheapest option from the subscription clubs. You could also do the two blade Sensor for less too. But you will have to search for lowest price on blades. Also, blades only go bad because of metal corrosion! So rinse, shake, and towel dry the blade, cartridge, and handle when you are done and it will last a month or more. If you have well water and a softer, you can probably get it to last longer. If your city water is hard, you will replace more often. Not because the blade rusts faster or slower but because soft water makes for a smoother shave so you do not experience the need for new blades as often as with hard water where, every little steel molecule on the blade tip matters for comfort and closeness. Store the unused blades in an airtight container out of the bathroom so humidity cannot rust them before you use them. Except for the good quality badger hair brush, all of this can be bought at drugstores or online. The brush online or a specialty shave shop. I’d try to get the brush from a shave shop. Then you can compare and feel it and confirm, real badger! You can also get a proper shave mug and a bar of shave soap for it. That bar will last you a year or years too. Me, while I still have my badger brush, I like the warm foam in winter on my face nowadays. Shorter handle of the best safety razor requires less effort and allows easy maneuvering of the razor for wet shaving which make it more reliable. I hope Harry's takes down Gillette. Those razor look so good for shaving fast! I can't wait to try one for me now. I hope it would be an amazing experience if I try those one. Thanks and hope will come in this site in near future. I use Harry's....Fantastic product, quick,clean shave !! I figured I would chime in since I've used both products. I began with Harry's razors. I was impressed with the amount of product included in the initial kit. The shave foam/gel, the blades and the razor handle was a great deal for $10 (I had a $5 coupon). The shave was fine, nothing mind blowing, but it did the job. I quickly came across a problem which became too tedious for me to deal with. The blades on Harry's razors are 'arched' or 'angled', however you want to look at it. Because of this, they clog up very quickly. I found it very difficult to clear this out. I have a long history with Gillette (Mach3 and Fusion), and NONE of the methods I used to clear clogs would work on Harry's blades. The only thing that would work for me was to take something thin (like a business card) and force it between the blades to push the debris out. For me, this was a necessary process each time I shaved. I emailed Harry's and they were nice enough to give me suggestions on how to prevent or easily rectify this. I had tried all but one of their suggestions. The only one I hadn't tried was 'taking shorter shave strokes'. I feel I gave this an honest effort, but it didn't make any difference for me. Maybe I still didn't take short enough passes. I eventually decided Harry's wasn't for me. I've been shaving with a blade for 10+ years, and to me, it's not worth it to change my shaving style so drastically to make Harry's work for me. I recently decided to give Dollar Shave Club a try. Similar model as Harry's, but more options. I opted for the 'Humble Twin' to start with, their cheapest model. It arrived in a small brown box fairly quickly after I ordered (cost $3). This came with a shave butter sample and (5) double blade cartridges. The handle is inexpensive, and very light weight, but that's what I paid for. I've only used it for two days so far, but I have to say I'm actually super impressed! No clogging whatsoever and I'm getting a nice smooth shave with minimal cuts. Another cool thing that I found with DSC is their referral system. For each person you sign up, you get a $5 credit towards any of their stuff. Harry's makes some good quality stuff, but it just wasn't right for me. DSC seems to be a better fit for my style. I had some reservations with going for the 'Humble Twin' system, but so far I have no complaints and I'm sticking with it. If you found my input helpful in deciding to go for DSC I'd love it if you would use my referral url to sign up. You'll get some decent razors either way, but it would help me out for sure. http://shaved.by/dKUQJ. Thanks!